Every second spent running the Hood to Coast relay. I raced hard and forged friendships with inspring, strong women from around the U.S. You can read about my journey here and here. A muddy, wonderful trail run at lunch after a torrential downpour earlier that morning. The best part? The guys let me lead so I didn’t have to make ’em wait at the bottom. Not having to play catch-up made the run that much more fun. (I’m a very slow trail runner – I’d rather not crack my head open!) And heck, you just can’t beat a trail run to break up the work day! Monday’s yoga session was just what the doctor ordered after the relay. It was an hour’s worth of recovery that my body desperately needed. I also managed to NOT fall asleep in shavasana, thankfully. Choosing to gut out a short tempo run rather than skipping it outright or after the first mile or so. My body and brain were wrecked after Hood to Coast, but I decided I just couldn’t duck out of Thursday’s three-mile tempo. I knew I’d feel worse not doing it than getting it done and having it hurt like hell. Out of the four gym sessions I should’ve completed, I did just one. Yes, I was out of town most of last week, but I just couldn’t get myself down there to workout. I was too dang tired. Failing to get to bed early to recover from the relay. I swore up and down all week that I’d be in bed by 9:30 so I’d get a full night’s rest, but… I didn’t. And my runs suffered because of that. 1) Yes, it’s been hot and humid. I know this makes for slower miles. And thankfully my trusty training log confirmed that I, indeed, ran the pretty much the same paces last year, too. Those “slow” training runs translated into my fastest marathon yet. 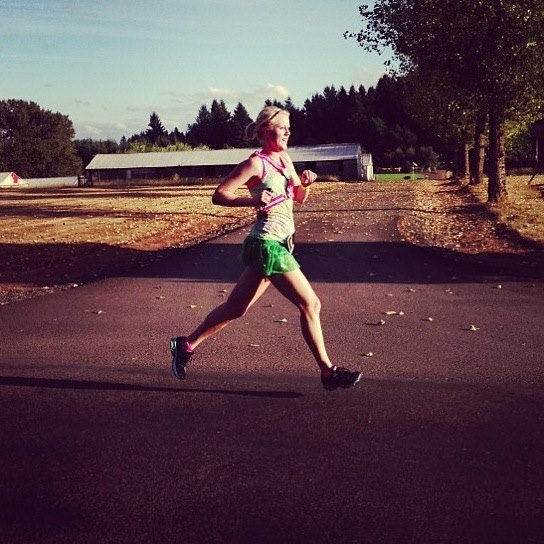 2) A speedy HTC roommate told me that she’s run in the 3:1X’s off of long runs at 8:15 pace. Yes, I know long, slow distances runs are supposed to be slow, but it took a real live person telling me just how slow to make me understand that I don’t need to run at or near “race pace” to actually hit it on the big day. Clearly, I’m still SUCH a stubborn marathon newbie! Learning as I go, right? Anyway…. ….We’re just TWO months away from the big day! Until next week! My long runs this cycle have been my slowest yet, not to mention shortest distance, too. I peaked at 31 last marathon and ran them all at a pace faster than I should have. This training cycle my longest is only 23 and I’ve been going at least 1/min per mile slower than goal place. The result; last weekend ran a new half PR and felt great maintaining marathon goal pace for the duration. It’s so hard for me to trust the training too, but I’m slowly learning. Same here! I finally was won over when I read about some elites who had an easy pace much easier than mine… oops! Thanks, good luck in the marathon!! Ha! That would do it! Which marathon are you training for? Running Smuttynose in NH. You? Marine Corps in D.C.! I’m excited! =) Heard good things about Smuttynose, too! Glad you had some awesome “highs”, as for the “lows” it definitely happens but you will move forward. Hopefully you can get some rest and give yourself a little mental boost. Pacing for long runs still baffles me after the 5 marathons and 13 half marathons I have done. It still is odd to me to run quite a bit slower than race pace…but it works. The biggest thing i have learned is to just go with it. Sometimes my long run paces are great and sometimes they just feel like wow, I couldn’t even hold that pace for one second longer. But when it all comes down to it, you get the miles in and that’s what matters. You are going to do awesome at MCM! Thanks so much for your thoughtful comment Laura! Glad to hear that it’s worked for you too! It’s only my second time training for a fall marathon, but I’m beginning to think it’s characterized by super-slow distance runs and faster races (hopefully). From here on out I’m trusting in these so-called long, SLOW days! I’m going with it Laura! Fingers and toes are crossed it works! haha Thank you! I have a good feeling about your training, especially since you definitely have both speed and stamina in those legs of yours! Hey, we all need a reality check every now and then, right? 😉 Looking forward to following the rest of your training! Can’t believe MCM is 2 months away! I hear ya on the long, slow runs. I feel like my long run paces have been much slower this training cycle, but I’m trying to stick to it since all the experts (and my running coach) seem to say it’ll work!! I know, right?!? SO SOON! Yep, my fingers and toes are crossed that the slowness will turn into fastness come MCM.